Well, it was a quick turnaround. And my voice still sounds a bit hoarse from travel, and possibly allergies, but we got the story of Thomas's triumphant return out to many millions of NPR listeners yesterday. No question. History was made at Glamis Arena, an open air stadium packed with some 22,000 fans of three generations, rocking it until dawn with Thomas Mapfumo and the Blacks Unlimited this Sunday morning. Mapfumo staged 17 musicians and dancers and delivered a full throttle, non-stop tour of his 50 years in music. Not since Bob Marley’s Independence concert in 1980 or Paul Simon’s Graceland show had such a crowd assembled in Harare in the name of music, nor been so enraptured. Mukanya, as his fans know him, has been away for more than 14 years. A whole generation has come of age knowing his music only from their parents’ CD players, or cassettes in “kombie” public transport vans, or, occasionally, on the radio. That same generation has been fed a stream of negative coverage about Mapfumo in state-controlled media--dredging up old controversies, sensationalizing his struggles as an exile in America, and generally depicting him as a has-been. Yet people came, young and old, and all came away knowing they had spent time with a legend. This was a night that changed the conversation in Zimbabwe. The legend was joined by his only real peer, his rumored “rival”—though the two are close friends—Oliver “Tuku” Mtukudzi. A jolt of electricity shot through the crowd when Tuku, ever the snappy dancer, stepped onstage to break some moves on the classic “Nyoka Musango"--a potent gesture of unity that Mapfumo beheld with evident pleasure. I have to stop for now. I'll just add that Mukanya opened with "Chikonzero" from the Danger Zone album and closed with "Chamunorwa," from heaven. Now, some images from the Big Bira, from the camera that survived the night! The cover photo from my book Lion Songs figured into the graphics promoting the concert, with my permission of course! The dawn unfolds with dogs and diesel fumes, also beer bottles and sim cards from nicked cellphones. No joke. Day 2. Another fine rehearsal. A ZBC interview in which Thomas told the youth of Zimbabwe that they should think hard about who they vote for and not vote for anyone unless they're convinced that person will work to make the country better. 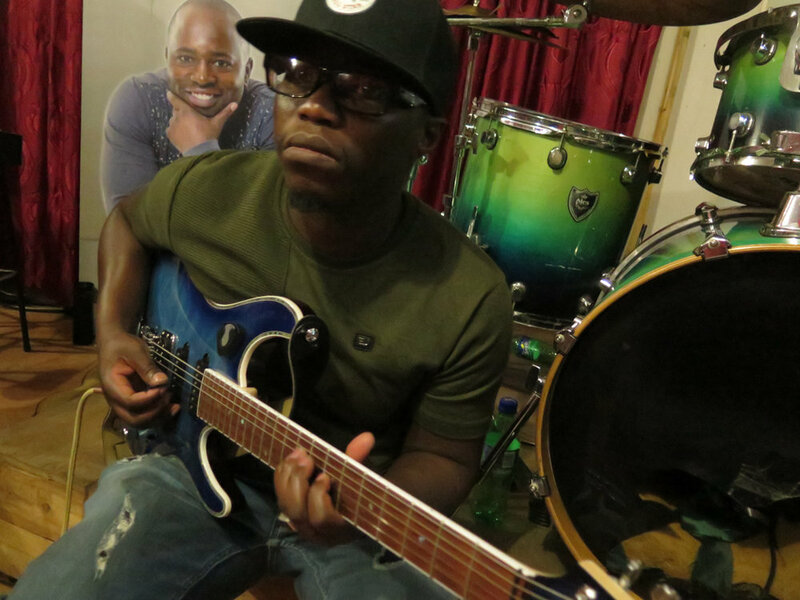 He also dodged a question about the rumor that he and Olliver Mtukudzi had recorded a song together. The question was, "Will you perform the song?" And the answer was no. Of necessity, since there is no such song, rumors aside. That message about voting is the subject of a new song, not yet finished. But somehow an unfinished version got to a pirate, who made this CD, leading with the new song and picking songs from other CDs. Sarudzo is not the real name of the song, but it means "voting" so it kind of works. The item is selling cheap on Harare streets, and Thomas and company are quite steamed about it. The CD even has a copyright notice.. Cheeky. There is such excitement about this show. People are definitely feeling it. Thomas invited myself and the filmmaker Simon Bright to a party his family threw for him at a nice rented house in Borrowdale. Great sadza! 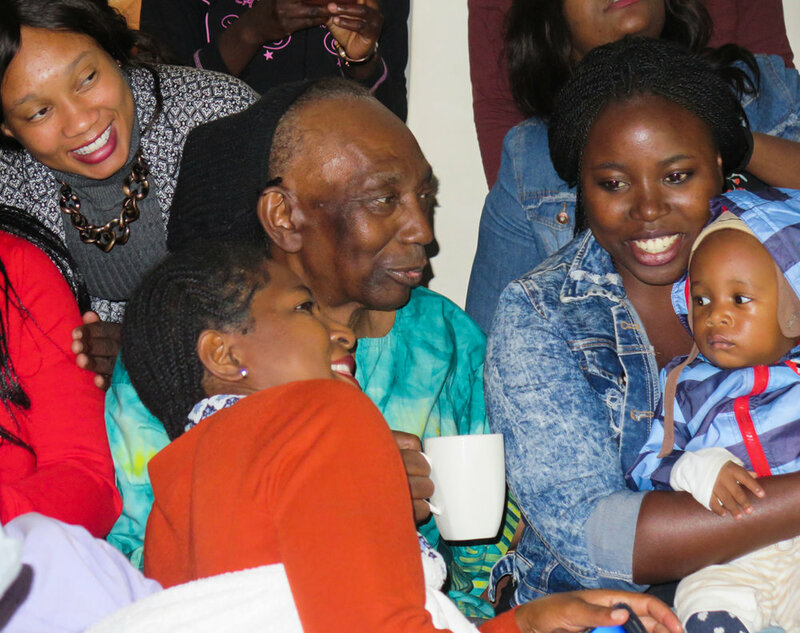 And a huge crowd of 3 generations (at least) of Mapfumos and Munhumumwes from Zim, UK, USA. Very moving. And the photo session at the end was epic. At last! Arriving in Harare was surprisingly easy. Zero hassles at the airport, all new and spiffy since I was last here. I was warmly greeted by Emely Chimanga, widow of the great mbira player Ephat Mujuru. A swift ride to the hotel, where I met an old musician friend, Lazarus Williams and we hooked up with the promoter who drove us to the rehearsal studio in Avondale. As soon as I stepped into the room, I was almost overwhelmed by the sound, like the Blacks Unlimited of old: 4 mbiras, 2 super strong guitarists, 3 percussionists, brass, 2 keyboards, 4 excellent backing singer/dancers, a young drummer and bass player from the U.K.. Thomas, seated at the center was in strong voice, an the band just moved song to song, not a moment wasted. Inspiring. The promoter said ticket sales for the big show on Saturday are going well. The stadium holds 20,000, and he wants the place full, a concert on par with the Independence celebration with Bob Marley in 1980, or the Graceland concert. Oliver Mutukudzi has joined the bill, making this gathering of legends. Younger bands will start the evening. The show will last from 8pm til 6am. Robert, Paradzai, Moses, Bezil. 4--count 'em--4 mbiras! Mapfumo Returns! My journey starts here? I confess, I'm not much of a blogger, but I've decided I will improve my act over the next few days as I return to Harare to watch Thomas Mapfumo perform his first show there in 14 years. For me, it's been even longer. The last time I saw Harare was in 2001, fully 17 years ago. This will be an historic event, and a time of great emotion for so many who have lived and loved chimurenga music, not least, me. My plan had been to arrive today to join the band in rehearsals tomorrow and Friday. But, fate intervened. A sick passenger delayed the Emirates plane I was to board, so our flight left 6 hours late, missing the connection in Dubai. As I wait for the next flight I've had a peek at this citadel of opulence. Quite something to see, and sure to enhance the culture shock of seeing Harare, circa 2018. More to come, I promise! The curtain has finally fallen on Africa’s oldest and longest-reigning despot. For Zimbabweans and those who love this beautiful and uniquely creative country, the event has been far too long in coming. One aches to remember all the times that the common wisdom on the streets of Harare was, “He can’t last another six months.” I heard that often when I lived there in 1997-98 researching a biography of Zimbabwe’s greatest popular singer, Thomas Mapfumo. The first food riots were beginning. So were brutally destructive seizures of white-owned commercial farms by gangs of “war veterans,” some of them far too young to have participated in the grinding guerrilla war that turned Southern Rhodesia into Zimbabwe during the 1970s. Riots and farm seizures were not yet international headlines in 1998, but driving through vandalized Harare after the unrest, Mapfumo was reminded of Rhodesian times, under the stubborn regime of Ian Smith. “People have been very patient in this country,” Mapfumo remarked. “They must not feel that they fought and died for nothing.” Few could have imagined then that Mugabe would cling to power for nearly 20 more years. Historians will debate the causes of such longevity. I look to Mugabe’s youth in the 1930s and ‘40s on the Zvimba Native Reserve north of Harare. His Malawian father ran afoul of the Jesuit priest who governed the village of Kutama. The family was forced to relocate, and remoteness contributed to the deaths of Mugabe’s two older brothers, who both succumbed to illnesses that might easily have been treated in town. Shamed, Mugabe’s father abandoned the family, only to return years later with three more children. Soon afterwards, he died, leaving 20-year-old Robert Gabriel Mugabe as head of a large, struggling family. It’s easy to imagine how deep anger and resentment, as well as profound personal strength, could result from these experiences. But already some Zimbabweans were seeing a darker picture. By the end of 1988, the first major corruption scandal of Mugabe’s now scandal-ridden rule had broken, and Thomas Mapfumo had bravely made it a part of mass culture with his hit song, “Corruption.” Over the next decade, Mapfumo would morph from the beloved muse of the liberation war to the most vocal popular critic of its result. 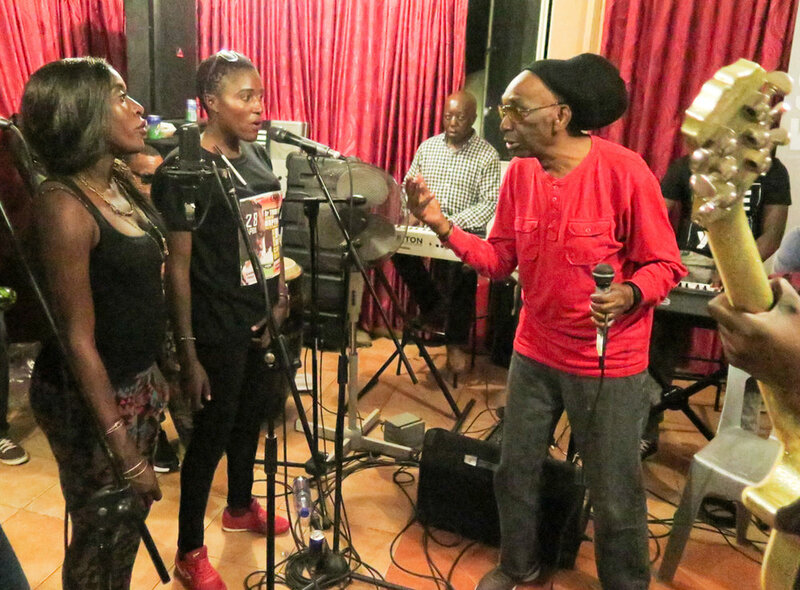 In the early 2000s, harassed and threatened, he would move his family to Oregon, not wishing his children to grow up and be educated in a country he then sang about as a “Disaster.” Mapfumo has not set foot in the land of his ancestors since 2004. Land, of course, is another key to Mugabe’s resilience. The Shona majority of Zimbabwe traditionally believes that the land where the bones of their ancestors lie is sacred. It must be revisited and cared for by generations of descendants, lest misfortune befall them. This belief meant that the forced relocations the Rhodesians imposed on Shona people were more than a matter of seizing fertile regions and leaving barren ones to the Africans. Relocation violated a generation’s most deeply held beliefs and values. Land seizures were not events lost in the mists of time either. Cecil Rhodes had arrived only in the 1870s and established his bare-knuckled regime around the turn of the century. That regime would continue to force people off their land for decades to come. Those who fought in the liberation struggle had close memories of losing their land. As Mapfumo often noted in his large catalog of chimurenga—roughly “struggle”—songs, the main purpose of the war had been to reclaim that land. Zimbabwe’s plight cannot be separated from its rapid and extreme experience of colonialism. After all, white Rhodesians did not come simply to exploit natural resources, though that was voracious adventurer Rhodes’s initial goal. They soon discovered the charms of this temperate, fertile, scenic and largely disease-free land, and decided to become Africans themselves. In addition to claiming the best land, this meant aggressive interference with local culture, shaming traditional practices, including religion, language and music, and replacing them with Christianity and Western values and aspirations. Resisting acculturation and restoring African beliefs and practices—notably through use of the music and sonority of the sacred, metal-pronged mbira—has been the dominant theme of Mapfumo’s music, beginning in the mid-1970s, well before Independence. Africans fought to retake their land, but Mapfumo was there to remind them that there were deeper matters at stake: culture, history, identity. How different things might have been had an orderly program of land resettlement begun right away, with the English, Rhodesian and Zimbabwean players who had participated in the war working on it together. As it was, the terms of peace in 1979 called for a 10-year pause. Momentum was lost. New leaders in England failed to follow through on promises made by their predecessors. Mugabe’s government sank deeper into corruption. By the time Mugabe moved in earnest to reclaim stolen land, it was an act of vengeance and fury, poorly managed, condemned by the world and brazenly used to whip up reckless and violent emotions, all as a cover for decades of failed economic policies that had rendered the country a shadow of what it was in the early years of Independence. So Robert Mugabe at last exits the stage, but the rot of endemic corruption and the tragic distortion of Zimbabwe’s once-visionary constitution will likely prove the most lasting consequences of his rule. Sadly, the new leadership does not promise dramatic change. Even if new leaders surprise us with their willingness to restore responsive and honest governance, it will take many years for Zimbabwe to truly recover the optimism and pride that I experienced at Mapfumo’s ecstatic performances there in the 1980s. The ecstasy we’ve witnessed with Mugabe’s departure could fade fast as the reality of his legacy lingers. One sure sign that things are indeed headed in the right direction will be the day that Thomas Mapfumo returns from exile to sing once again for the people who love him most. The events of the last 24 hours in Zimbabwe are exciting and long overdue! It seems that the end of the Mugabe era is at last at hand. As a sign, we hear that Thomas Mapfumo's music is once again being played freely on the radio in Zimbabwe. As a small gesture of celebration, Lion Songs, the book, is now on sale for $20. I humbly suggest that it is a fine way to catch up on the remarkable history leading up to this remarkable moment. Mhoze Chikowero and Banning Eyre share the prize. Nice shirts, guys! I am thrilled to announce that Lion Songs shares the Society for Ethnomusicology Kwabena. Nketia Book Prize for 2016 with Mhoze Chikowero's African Music, Power, and Being in Colonial Zimbabwe (2015 Indiana University Press). The prizes were announced by ethnomusicologist Jean Kidula at the annual SEM meeting in Washington DC on November 11. 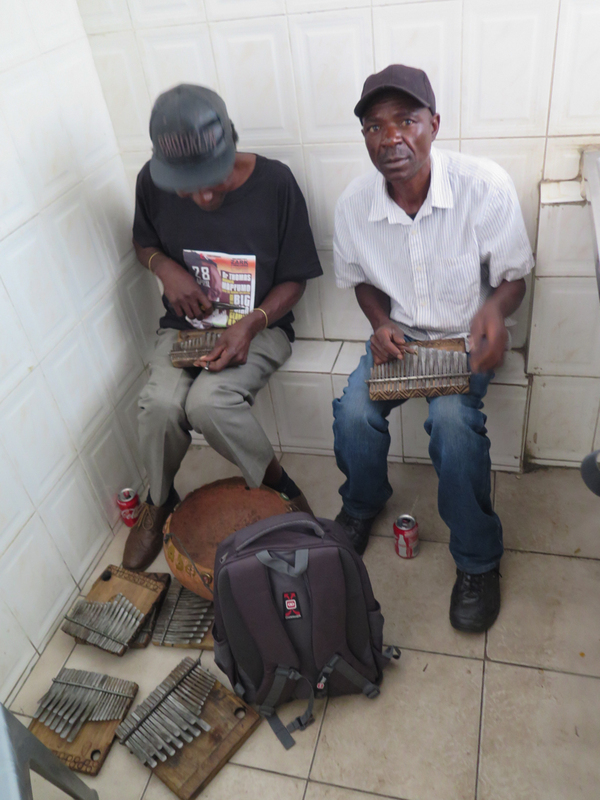 The announcement noted that both books are "compelling historical works on the working of music in Zimbabwe's contemporary national and social politics." Regarding Lion Songs in particular, Kidula said, "We didn't want to put the book down. It felt like a novel.... Banning's writing is engaging and poetic, carefully utilizing storytelling, biographies, and detailed descriptions as well as analyses of sonic and extrasonic elements." Extrasonic indeed! Interesting that Mhoze is a historian and I am a writer, but we seem to have written the panel's favorite ethnomusicology works of the year. I should note that Mhoze is a friend, and we worked together on an Afropop Worldwide program on Thomas Mapfumo during the Mugabe Years. It's an honor to share this prize with him. And thanks to SEM and the panel for their vote of confidence. Hoping they will now buy the book and CD, from this website! Here's an interesting new review of Lion Songs in The Herald. This is a government-controllled newspaper in Zimbabwe, however Fred Zindi is a longstanding writer about Zimbabwean music, and he's given the book a thoughtful read. Click on this photo to see Fred's review. Getting ready to hit the road with Lion Songs. So far, getting some significant love from radio. Probably the biggest catch so far is this interview with Robert Siegel at NPR's All Things Considered, Robert told me that he covered Zimbabwe's liberation struggle from London in the early days of NPR, so he had a real feeling for the subject. He's more of a classical music guy, but Mapfumo's sound clearly touched him, especially the mbira-based songs, whose connection to Shona religion fascinated him. The interview was, of course, longer than this, but the editing was very nicely done. Kudos to Greg Dixon on that. The only thing I miss was our discussion of how Lion Songs tries to understand the feelings and thinking of those who defend Robert Mugabe's controversial land policy. Robert pressed me on that, and we got a bit into the weeds--but interesting weeds. Well, another time. I can't complain. It's a fine piece.